Please take a look at our newly renovated rooms and book your getaway online today. 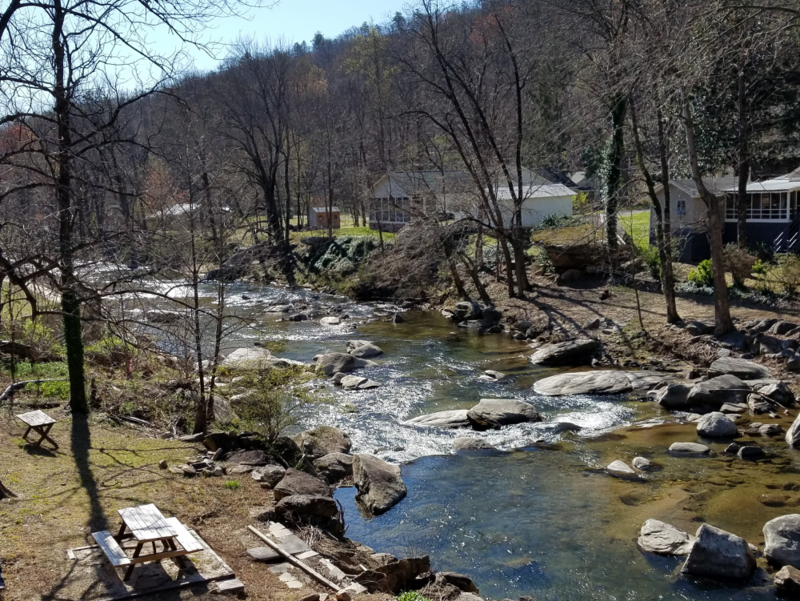 Please do call us at 828-375-0157 if you have any questions or would prefer to reserve your room by phone. 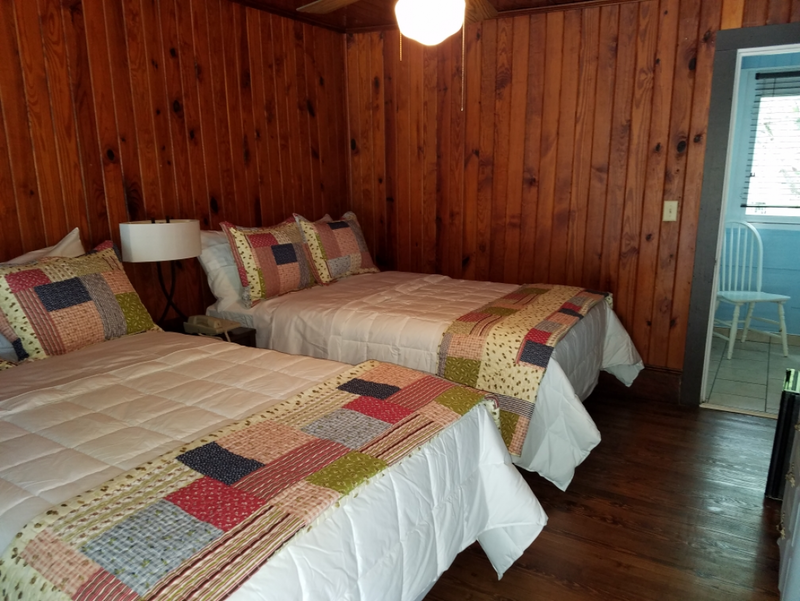 The Mountain Dream Room is an end room with knotty pine walls and ceiling, a ceiling fan, hardwood floors, and a bath with river rock bottomed shower. 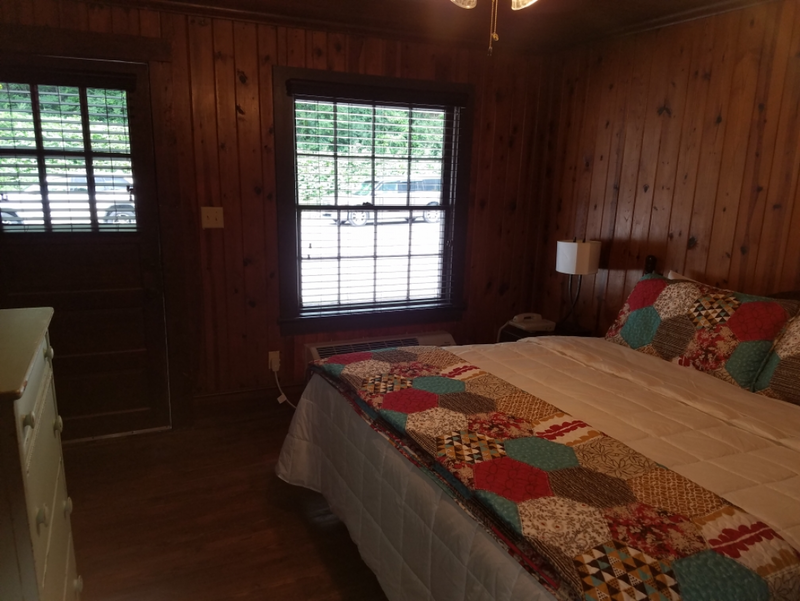 The room is approximately 220 square feet with an alcove window for viewing the river. 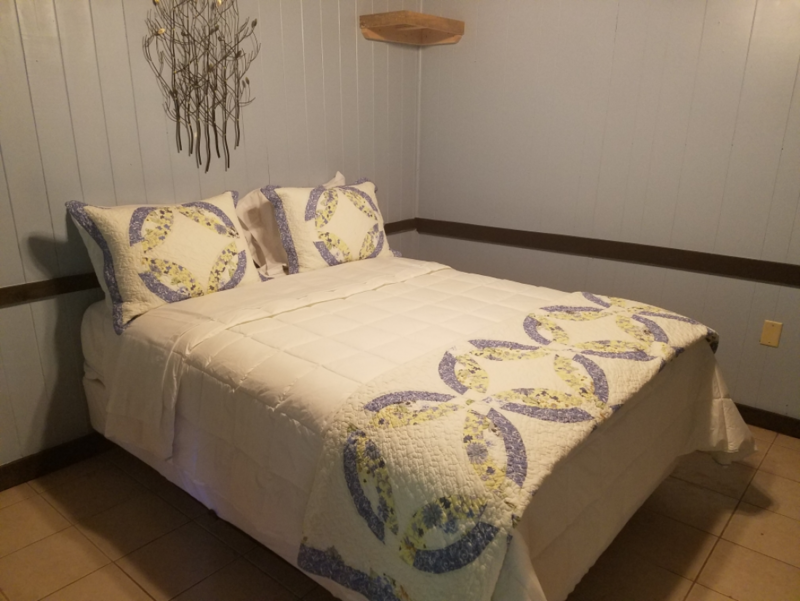 Mountain Dream features high quality cotton bedding with beautiful paisley quilts on the two full size beds. Sleeps four. The Black Bear Room hosts two full size beds with a black bear theme. 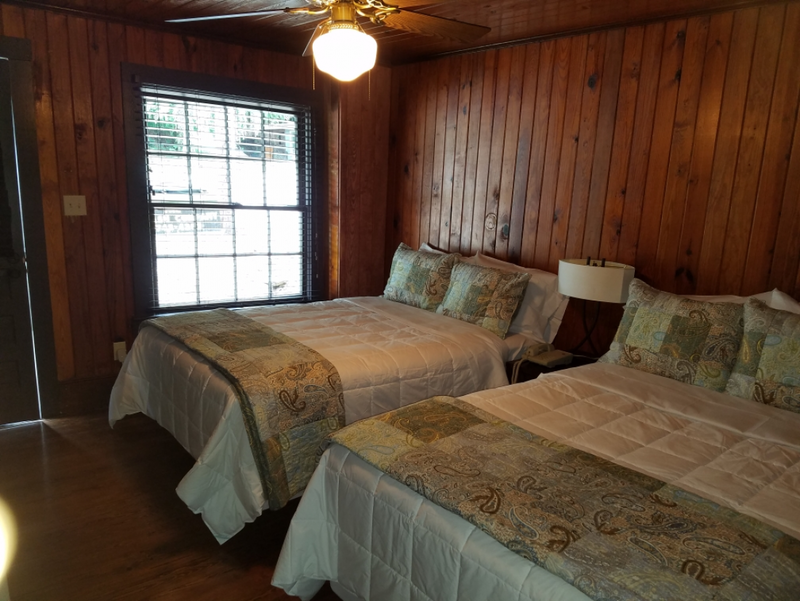 The room has knotty pine walls and ceiling, a ceiling fan, and a bath with a bathtub/shower combination. The room is approximately 220 square feet with an alcove window for viewing the river. 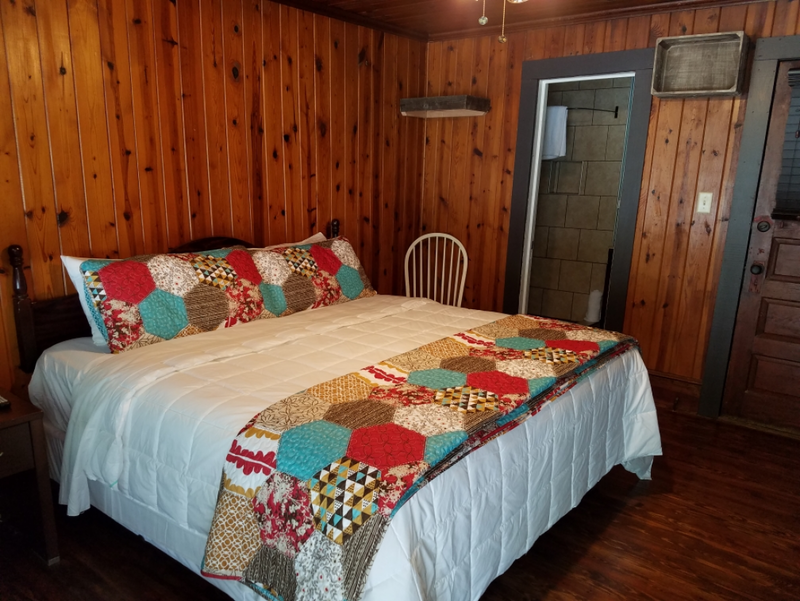 The Black Bear Room features high quality cotton bedding and quilts. Sleeps four. The Savannah Room is an adjoining room to Savannah Too. 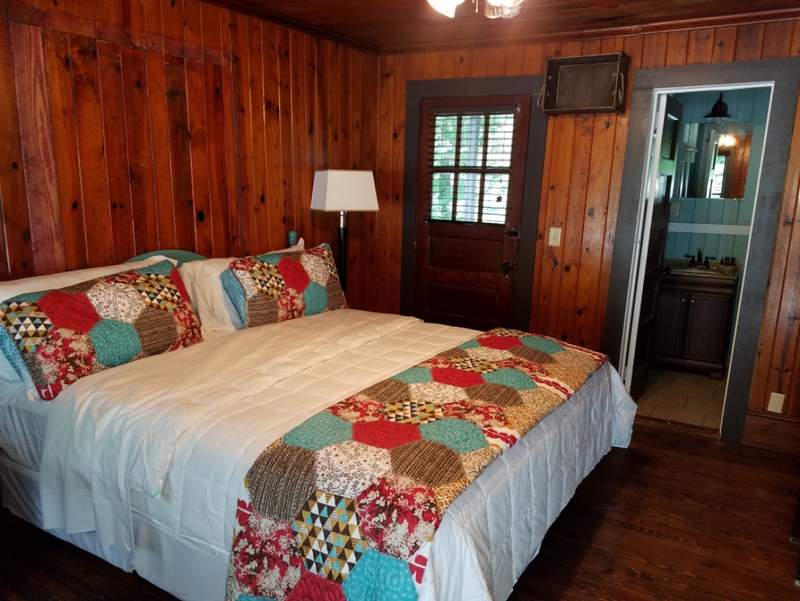 The Savannah Room features the knotty pine woodwork and hardwood floors, along with two full size beds with vintage style quilts. The room is approximately 230 square feet with tiled alcoves for viewing the river and for entering into the adjoining room. 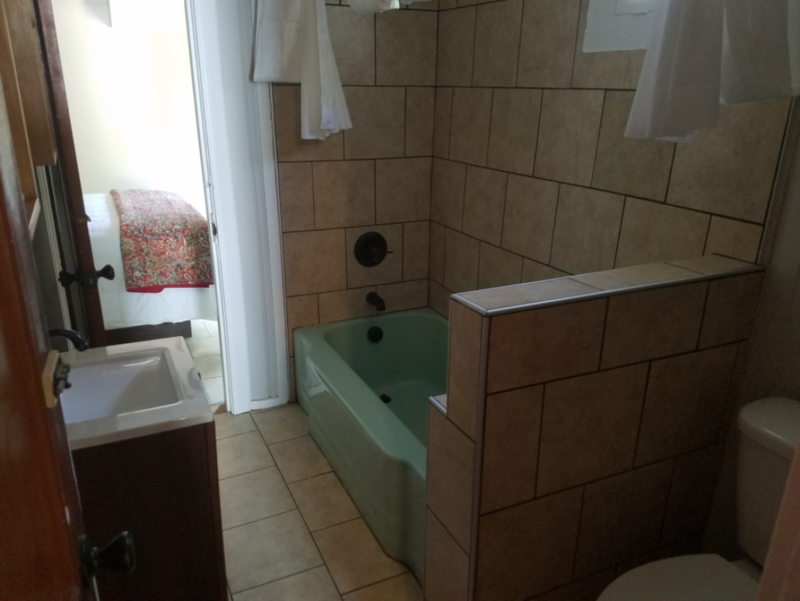 Tub/shower combination. Sleeps four. Suite sleeps 6. 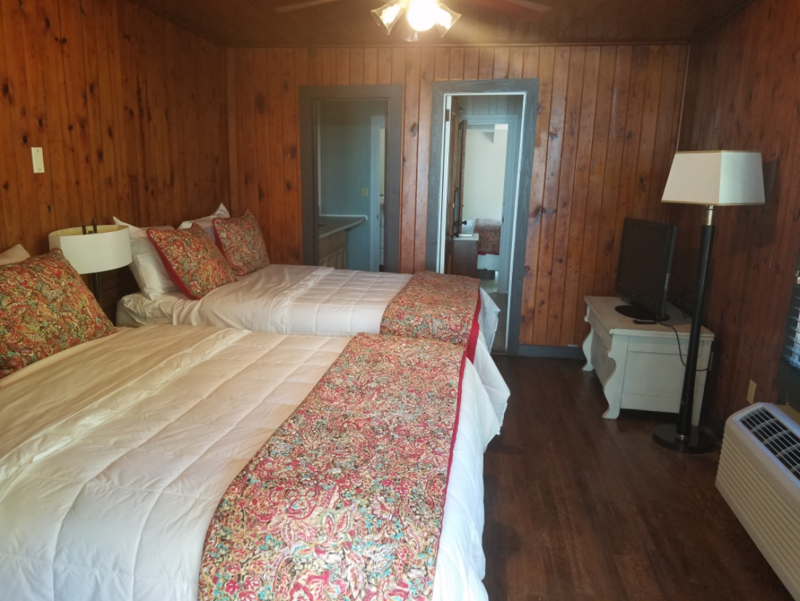 The River Rock Room features the original knotty pine woodwork along with a newly renovated bathroom with river rock bottomed shower. 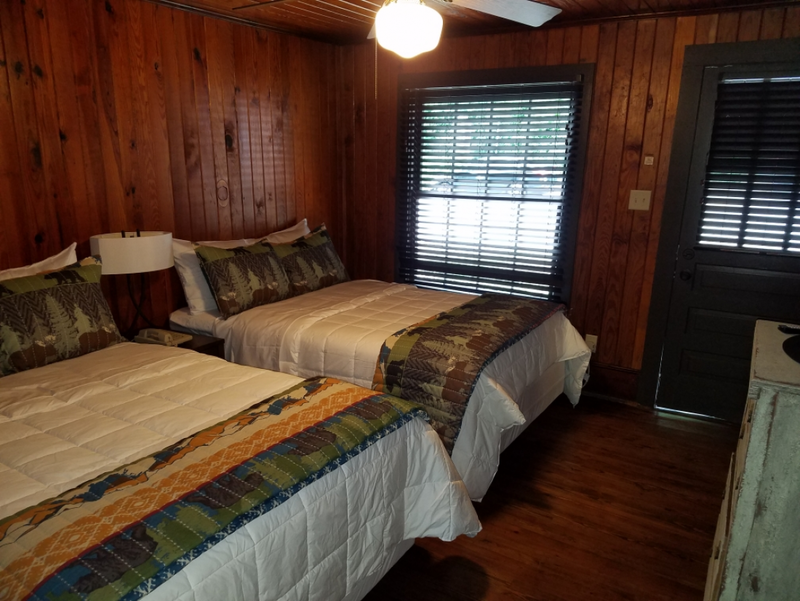 The room is approximately 220 square feet with a King sized bed and private covered riverside balcony with table and chairs for morning coffee or evening drinks. End room near the lobby. Sleeps 2. 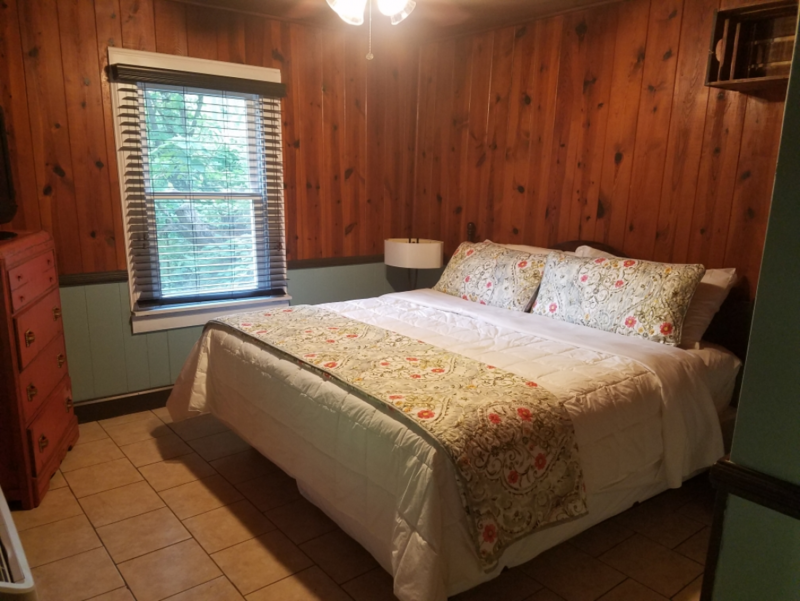 The Mountain Laurel Room also features the original knotty pine woodwork along with a newly renovated bathroom with river rock bottomed shower. 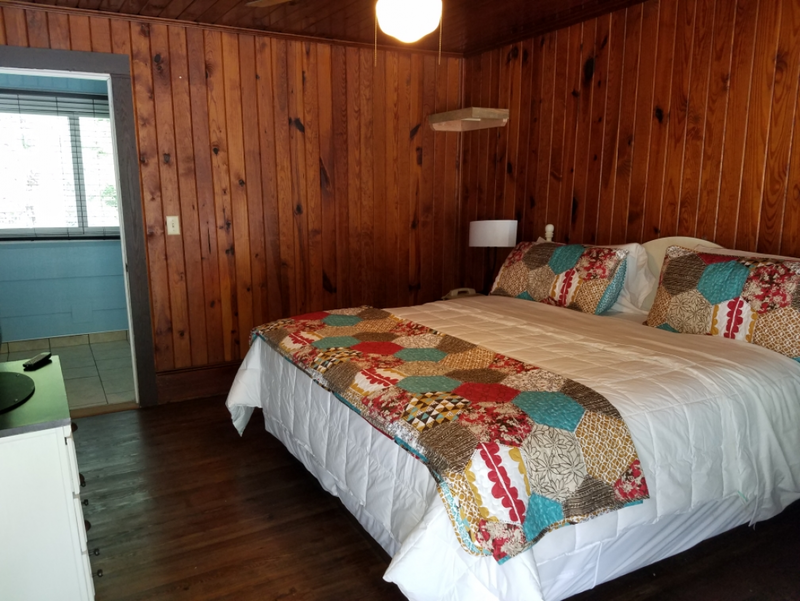 The room is approximately 220 square feet with a King sized bed and private covered riverside balcony with table and chairs for morning coffee or evening drinks. Sleeps 2. 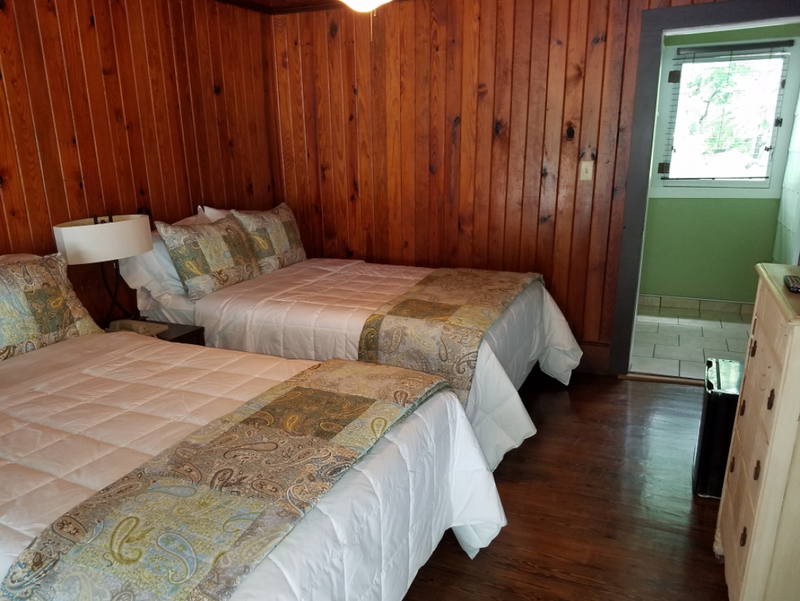 The Rocky Broad Room features the original knotty pine woodwork along with a newly renovated bathroom with river rock bottomed shower. 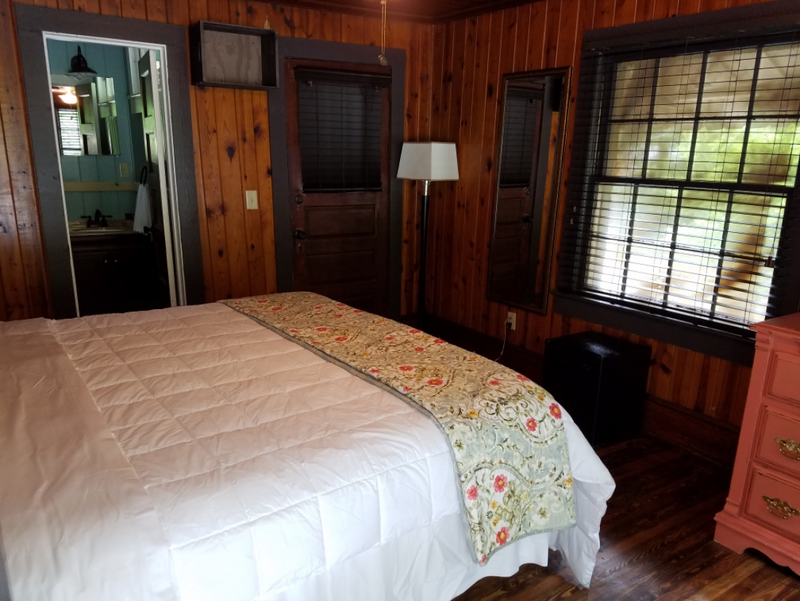 The room is approximately 220 square feet with a King sized bed and private covered riverside balcony with table and chairs for morning coffee or evening drinks. Sleeps 2. 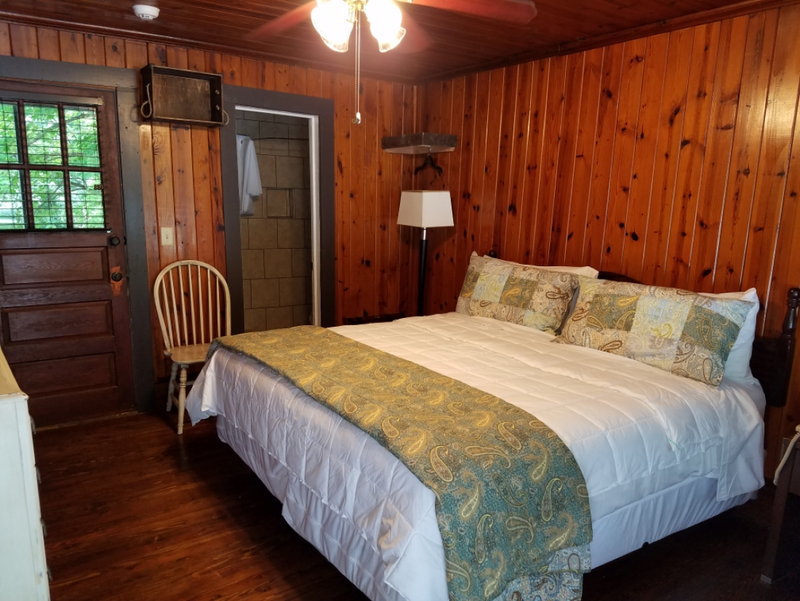 The Chimney Rock Room features the original knotty pine woodwork along with a newly renovated bathroom with river rock bottomed shower. 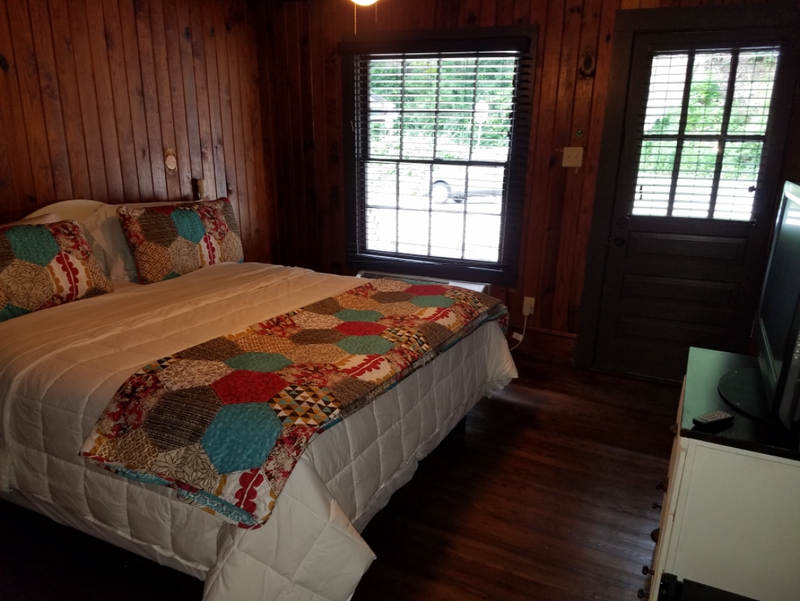 The room is approximately 220 square feet with a King sized bed and private covered riverside balcony with table and chairs for morning coffee or evening drinks. 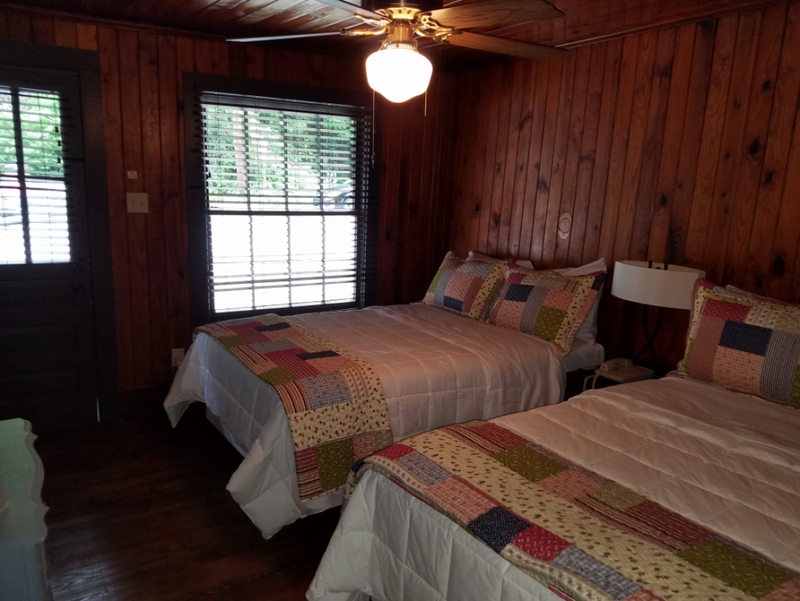 This room offers a clear view of Chimney Rock as well as the Rocky Broad River. End room. Sleeps 2. The Wilmington Room has an entrance on the riverside and is approximately 185 square feet. It features a queen size bed with a vintage style quilt in beautiful blues, purples and greens. This is an end room near the stairs to the river. 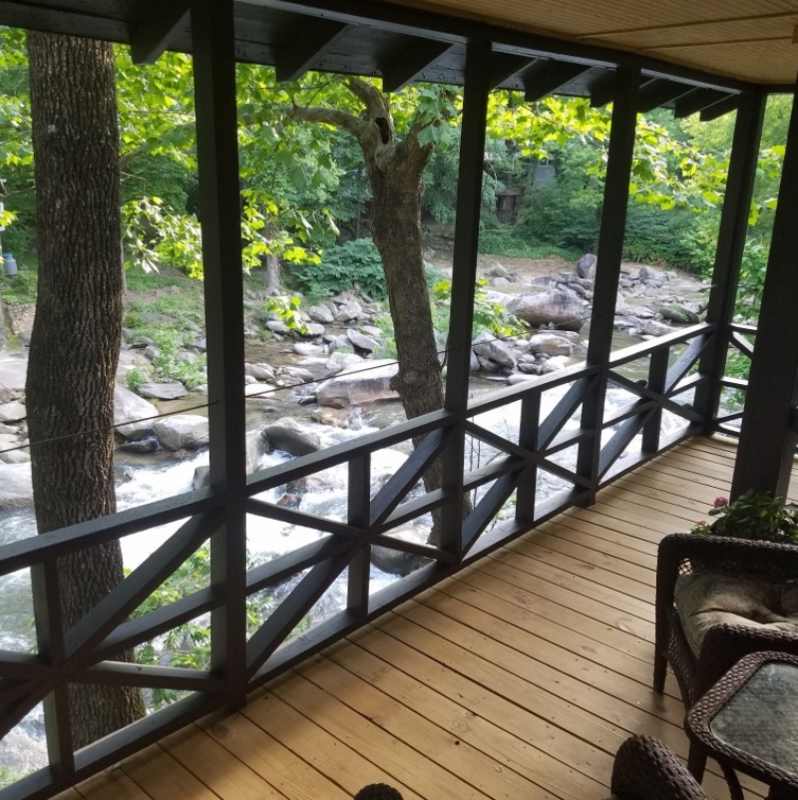 While this is one of the smaller rooms, the large 400 square foot porch makes this an amazing room to enjoy the beautiful Rocky Broad River. Shower. Sleeps 2. The Carolina Room also has its entrance on the riverside and is approximately 150 square feet. 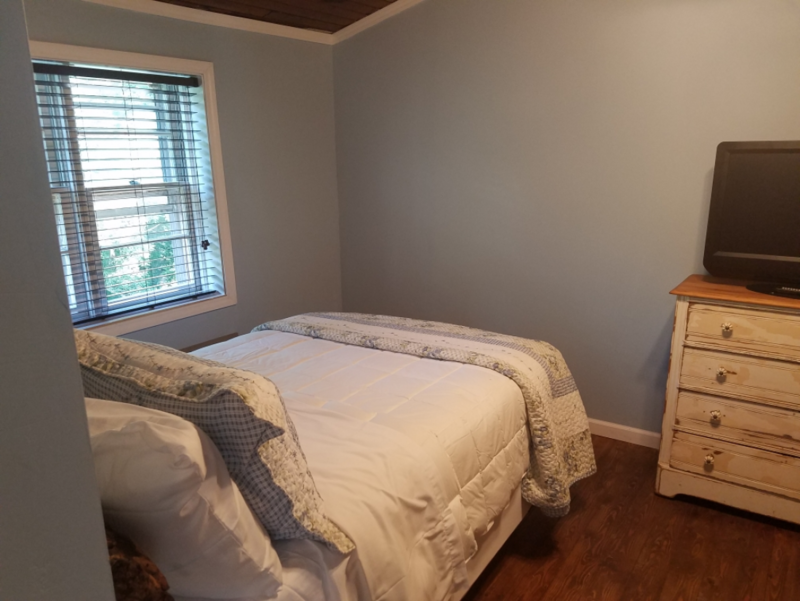 The Carolina blue walls accent the beautiful original knotty pine ceilings. 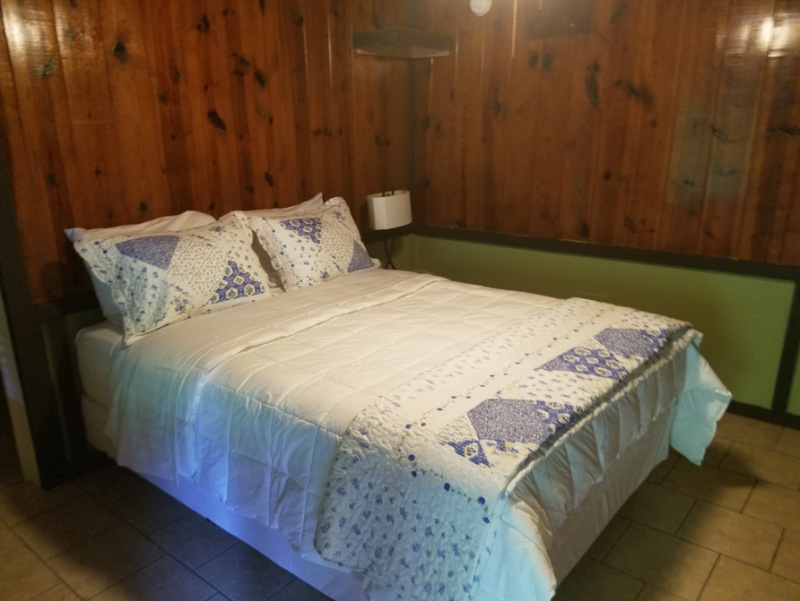 This room has a queen-sized bed with a vintage blue and white quilt. This room also opens onto the large porch on the riverside. Shower. Sleeps 2. 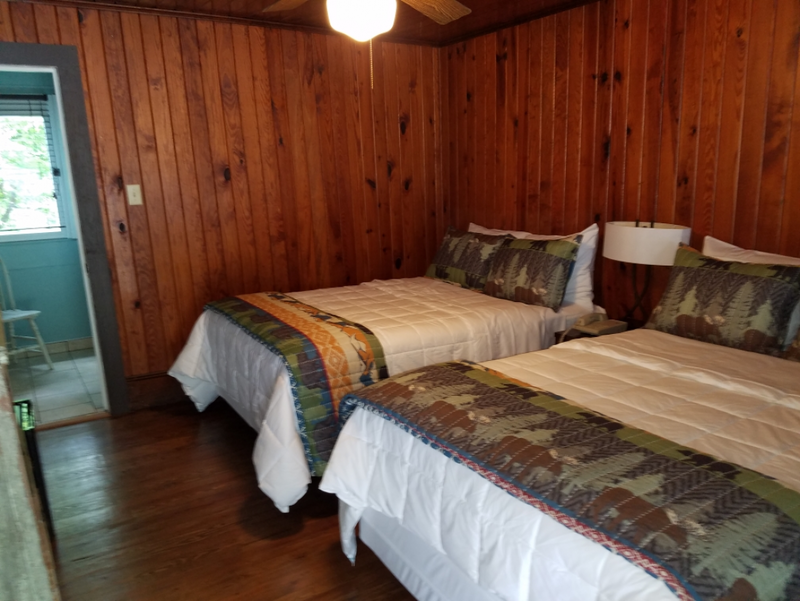 The River Rapids Room is an end room featuring a King bed and beautiful knotty pine walls and ceiling and tiled floors. The room features two windows that give a beautiful view and sound of the river rapids of the Rocky Broad. 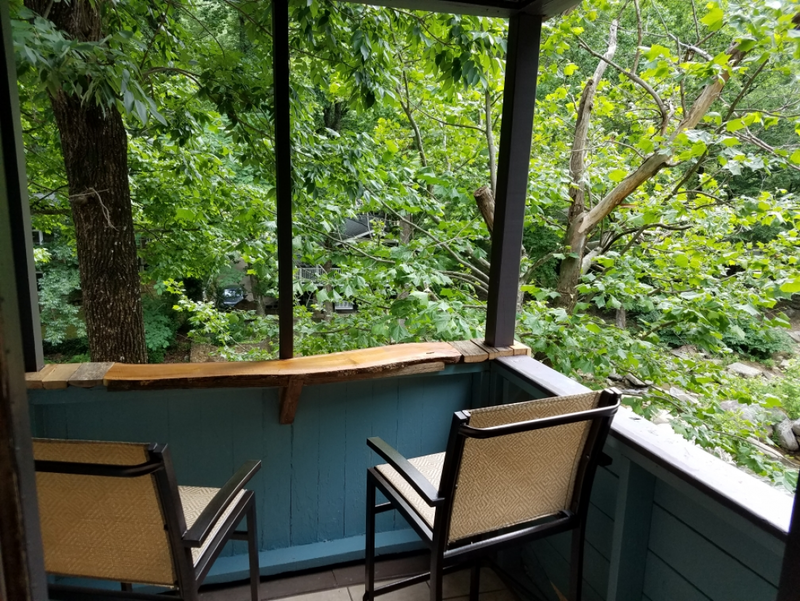 At the end of the large porch on the riverside is a quiet spot with table and chairs for morning coffee or evening drinks. Shower. Sleeps 2. 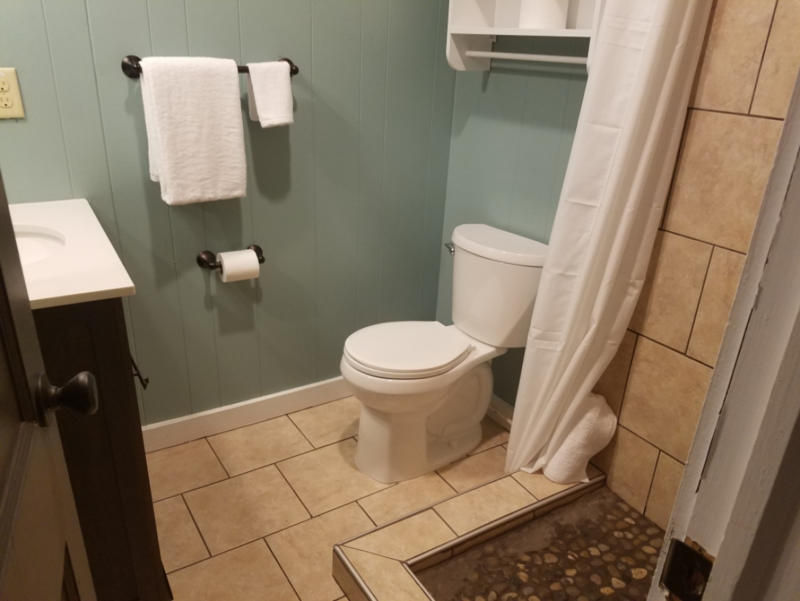 Enter the Riverside Suite just below the lobby where you will find two queen beds, a kitchenette, a bathroom tub/shower combination, and another bedroom with a third queen bed. This bedroom as a private entrance and riverside deck with stairs leading back upstairs near the entrance. This suite is perfect for longer stays or families with children. Sleeps 6. The Trellis Suite features an entrance near the lobby with a hallway and large kitchenette area with sitting area. 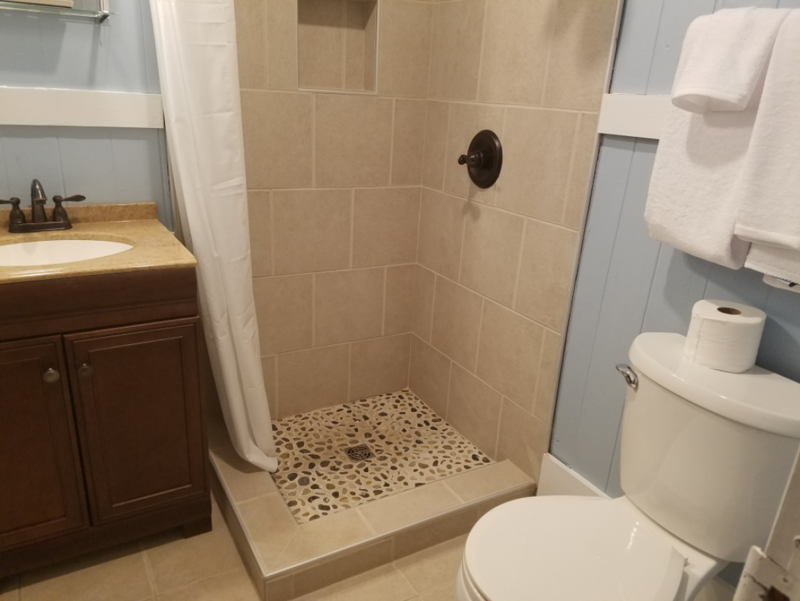 The suite is handicapped accessible with a large tiled shower and accessible doorways. 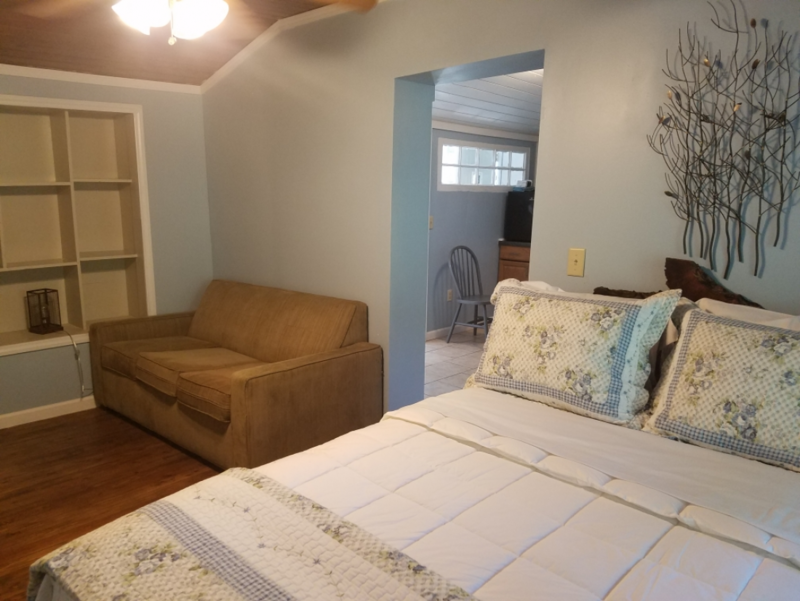 Just off the kitchen is the living area with a sleeper sofa and one full bed. 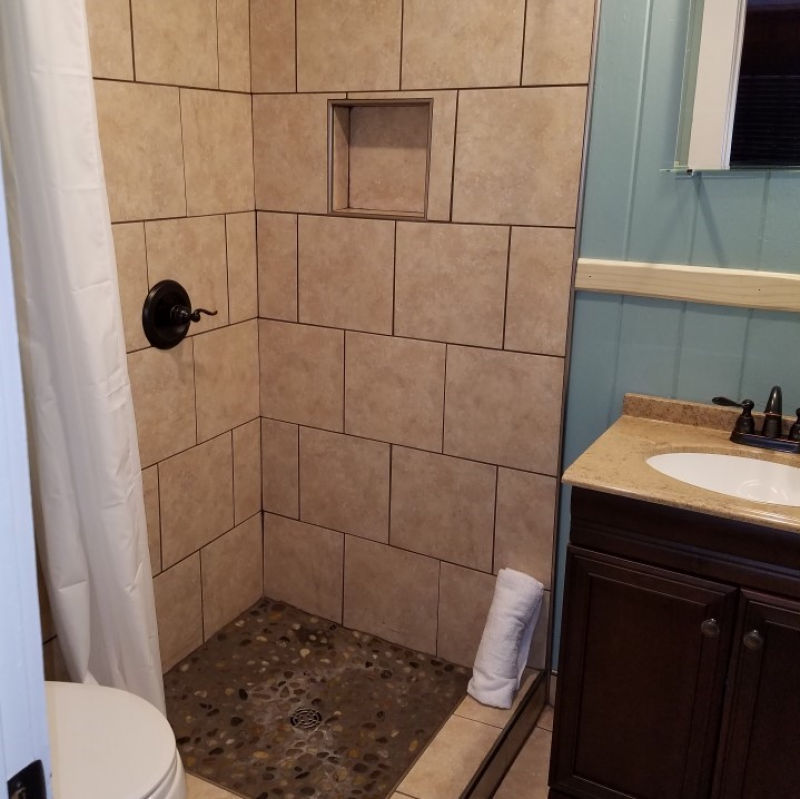 Kitchen and bath are tile floors and living area is hardwood. This suite is in the same building as the lobby. Sleeps 4. The office hours are 8:00am to 8:00pm. Please make arrangements for late check in by calling our office before 6:00 pm at 828-375-0157. Thank you!